Offering you a complete choice of products which include Raspberry Boards and Accessories such as Raspberry Pi - Model B, Raspberry Pi - Model A and Raspberry Pi Camera Module. We first met Alex Klein shortly after we’d launched the Raspberry Pi, when he was working for Newsweek and came to visit to write a story about us. Next we’d heard, he’d left Newsweek to start a company with Raspberry Pi at its heart. Today, he and his team have launched their project on Kickstarter. Kano is one of the nicest Pi kits we’ve seen to date, and is aimed squarely at users who aren’t confident of their technical skills right out of the gate. It’s easy to put together, all the bits and pieces you’ll need are right there in the box, the software environment is designed to be accessible and intuitive, and the Kano team think it’s a great way into Raspberry Pi (and into computing) for young people, for people who don’t have computing experience and for other beginners. Raspberry Pi2 Model B 512MB RAM Please note some boards are made in the UK, some China. WE DO NOT KNOW IN ADVANCE WHICH ONES YOU MAY RECEIVE! Description: Who wants pi? The Raspberry Pi has made quite a splash since it was first announced. The credit-card sized computer is capable of many of the things that your desktop PC does, like spreadsheets, word-processing and games. It also plays high-definition video. It can run several flavors of Linux and is being used to teach kids all over the world how to program... Oh yeah, and it does all that for under $50. The secret sauce that makes this computer so small and powerful is the Broadcom BCM2835, a System-on-Chip that contains an ARM1176JZFS with floating point, running at 700Mhz, and a Videocore 4 GPU. The GPU provides Open GL ES 2.0, hardware-accelerated OpenVG, and 1080p30 H.264 high-profile decode and is capable of 1Gpixel/s, 1.5Gtexel/s or 24 GFLOPs of general purpose compute. What's that all mean? It means that if you plug the Raspberry Pi into your HDTV, you could watch BluRay quality video, using H.264 at 40MBits/s. But wait, there's more. The Model B also has a 10/100 Ethernet port so you can surf the web (or serve web pages) from right there on the Pi. The system volume lives on an SD card, so it's easy to prepare, run and debug several different operating systems on the same hardware. Most Linux distributions for the Pi will happily live on a 2GB SD card but larger cards are supported. The Model B's two built-in USB ports provide enough connectivity for a mouse and keyboard, but if you want to add more you can use a USB hub. It is recommended that you use a powered hub so as not to overtax the on-board voltage regulator. Powering the Raspberry Pi is easy, just plug any USB power supply into the micro-USB port. There's no power button so the Pi will begin to boot as soon as power is applied, to turn it off simply remove power. On top of all that, the low-level peripherals on the Pi make it great for hardware hacking. The 0.1" spaced GPIO header on the Pi gives you access to 8 GPIO, UART, I2C, SPI as well as 3.3 and 5V sources. Mating ribbon cables can be found in the related products below. 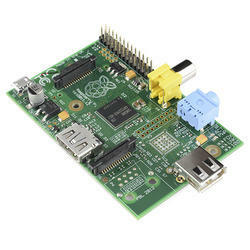 Description: The Raspberry Pi Model A is here! 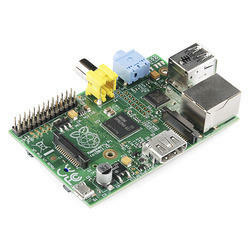 This is the ideal model for anyone on a budget but still wants a piece of the Pi. The credit-card sized computer is capable of many of the things that your desktop PC does, like spreadsheets, word-processing and games. It also plays high-definition video. It can run several flavors of Linux and is being used to teach kids all over the world how to program... Oh yeah, and it does all that for under $40. Though the Model A lacks half the RAM of the Model B, a USB2.0, and the 10/100 Ethernet USB adapter, the price should definitely make up for it. The system volume lives on an SD card, so it's easy to prepare, run and debug several different operating systems on the same hardware. Most Linux distributions for the Pi will happily live on a 2GB SD card but larger cards are supported. The Model A's built-in USB port provide enough connectivity for a Wi-Fi adapter, mouse, or keyboard, but if you want to add more you can use a USB hub. It is recommended that you use a powered hub so as not to overtax the on-board voltage regulator. Powering the Raspberry Pi is easy, just plug any USB power supply into the micro-USB port. There's no power button so the Pi will begin to boot as soon as power is applied, to turn it off simply remove power.